At the TGR Foundation, we have a proud history of building diverse communities committed to helping young people thrive. 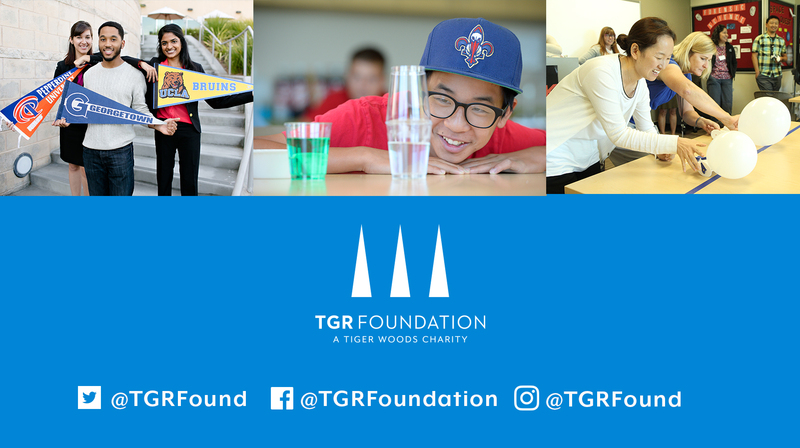 While Tiger is the foundation’s largest contributor, our impact grows and the work is strengthened in partnerships with others who share our dedication and passion for youth, education and the future. As our founder and primary contributor, Tiger Woods not only casts the vision, but relentlessly supports our pursuit of quality education for all. The family motto of “share and care” prompted Tiger and Earl to start the foundation over two decades ago. Since then, Tiger’s pursuit of excellence has driven us to pioneer STEM education and positive youth development programs for 150,000 students, with expansion plans to reach millions. Hexadyne Corporation is an inaugural supporter of the Unexpected Champions Fund. CEO Robert Sanchez stated: "the Hexadyne team is proud to support the TGR Foundation and its dedicated efforts to bring STEM to the forefront of its education objectives. The foundation’s commitment to STEM is the key to providing students with the tools to succeed in the classroom, but this is just one part of the foundation's multifaceted approach to enabling students for life. I have had the opportunity to visit the TGR Learning Lab and see first-hand what they are doing, and this is more than education. Tiger and his team are focused on developing the whole person, so they can excel in all aspects of life. This is why Hexadyne has partnered with the TGR Foundation. Foundation has been able to serve more than 16,000 youth, parents and educators through our Career Exploration, College Readiness, Scholarship and Professional Development programs. In addition, the unrestricted grant provided by Honda enabled the foundation to enhance, expand and enrich all aspects of our high-impact educational programs, including R&D and ongoing evaluation. Through USLI’s generous contribution, the TGR Learning Lab at Philadelphia’s Cristo Rey High School opened in 2013, providing unique educational opportunities in STEM for its students and youth in the surrounding community. Today, the partnership continues to thrive with after-school and weekend programs that expose students to careers in STEM through hands-on projects that build real-world connections. Rather than studying a textbook, students have the opportunity to take on the role of marine biologist, robotics engineer, video game designer and more. The Bank of America Foundation, Inc.